In the 1950s, NASA engineers were looking for a quiet place to build a network of large radio antennas. The idea was to build a series of antennas with huge parabolic dishes and receivers that could detect extremely faint radio signals. After scouting multiple locations, they selected a remote stretch of the Mojave Desert near the ghost town of Goldstone and the U.S. Army’s Fort Irwin—an area. This was a great choice as the region had no interference from power lines or commercial radio and television transmitters. The largest and most sensitive antenna at the Goldstone Complex is now at Mars Station. It spans 70 meters (230 feet), stands 24 stories tall, and weighs 7.2 million kilograms (16 million pounds). One of the satellites this antenna is used to communicate with is Voyager 1, a far-roving spacecraft launched in 1977. Voyager 1 is now more than 13 billion miles (21 billion kilometers) from Earth, making it the most distant human-made object in the universe. Echo Station is the current administrative center for the complex. Built in 1959, the station was named for early experiments performed with the Echo 1 communications balloon. The metallic balloon, known as the world’s first communications satellite, ascended to 1,600 kilometers (1,000 miles), and relayed radio and radar communications between an antenna at Echo Station and a receiving station in New Jersey. In a departure from the traditional method of naming a station for the first mission supported, Gemini Station is named for the twin stars in the Gemini constellation. The antennas were originally built by the Jet Propulsion Laboratory for the Army and were transferred to NASA in 1994. The first mission Gemini supported was the Solar Heliospheric Observatory (SOHO), a cooperative mission between NASA and the European Space Agency (ESA). 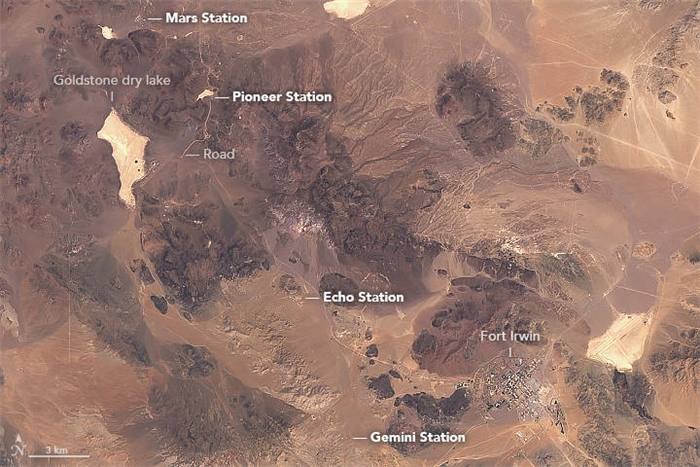 The Goldstone complex is just one of three facilities in NASA’s Deep Space Network. Similar stations exist in Madrid, Spain and near Canberra, Australia. The strategic placement of the three sites allows for constant communication with spacecrafts as the Earth rotates.